Our stay in Upper Provence is at the border of the well known region of southern France with a more mountainous, less populated area to the north. The long ridge of the Lure Mountains is generally considered to be the actual frontier between two different worlds. We explore the territory found immediately to the north of this ridge, a combination of rugged slopes, wide rocky riverbeds and tiny hamlets. Not very far from here, we venture into a highly remote valley of the Southern Alps, a region called "Queyras" with solid farming traditions. 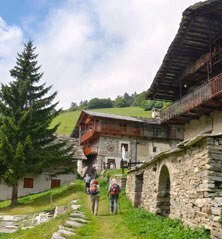 Our 'home' is just down from St. Veran, the highest village in Europe at 2000m. From our base the walks will take us even higher towards the border of Italy, over ridges in excess of 2800m. The Monviso, one of Italy's proud summits at 3841m will soon become a familiar landmark. 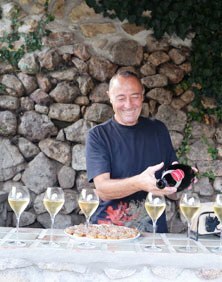 Back to lower country, we then find ourselves in "Ardèche" a part of the Cévennes in the Massif Central with particularly strong traditions. Generations of farmers carved the steep slopes into countless terraces to scrape their survival from this tough but majestic country. Chestnut trees (bread tree in the popular language) were essential to the subsistence of local populations for centuries and we don't leave this region without a good "roasted chestnut party! Finally our journey allows us to discover some parts of Savoy - further north in the Alps than earlier in the tour. 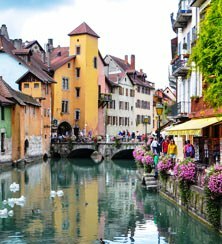 Our base is in the superb town of Annecy, renowned for the breathtaking beauty of its lake and the picturesque atmosphere of the old town. 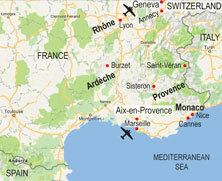 Annecy is only a short distance from Geneva in Switzerland. The lake is surrounded by tall mountains and for obvious reasons hiking is the favourite hobby of most locals. Our base in upper Provence is a charming small hotel in Sisteron. Here we are treated to some of the region's specialties, one of them being the Sisteron lamb, renowned nation-wide! In Queyras we make a small but comfortable 2 star hotel our home. The vast outside terrace is the ideal place to relax and enjoy the late afternoon light after a day up and down high mountain tracks. Our hosts treat us to some "serious" mountain dishes, often based on locally produced cheese. In Ardèche our home is again in a "Maison d'Hôtes", on the side of a roaring torrent with a 20m high waterfall right at our doorstep. The enthusiastic owners have turned an 18th century silk mill into charming accommodation. Their dining table draws respect from all around the place and offers a range of very inventive and tasty dishes based on local products. 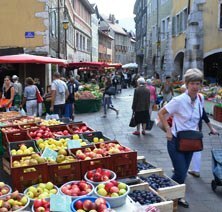 In Annecy we stay in a cozy 3* star hotel a few steps away from the lake and at walking distance to the busy town centre. From our hotel it takes about 15 minutes on foot along the lake to reach the old part of town. For our dinners we have chosen some of the most inviting restaurants. 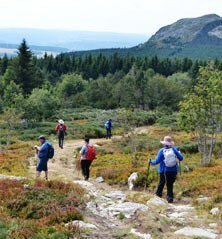 Departure dates have been arranged to allow the "Timeless Valleys", "Follow the Gourmet Trail" walks to be combined. While Gilles special tour must always be fabulous, to see it in the soft autumn light was magical." 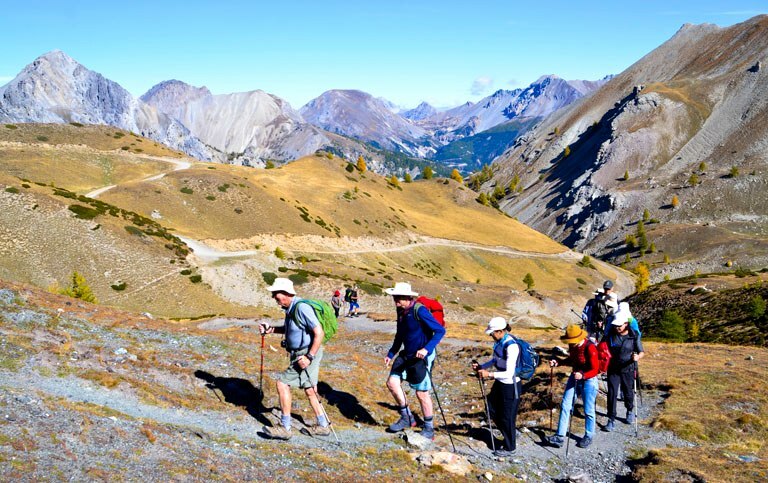 An outstanding walk with a beautiful mix of autumn colours; mountains, lakes and forests; local villages, produce and wine; cowbells, marmots and eagles; varying terrain and activities, with an outstanding group leader." There were so many highlights, from the challenging mountain walks with spectacular scenery, the wonderful variety and quality of evening meals and of course our wonderful guide Gilles as well as the visit to Gilles's remote family farmhouse for lunch cooked on the fire. Our accommodation was very good and comfortable and the choice of restaurants for the evening meals excellent. We enjoyed Gilles company, his knowledge, humour and guidance." A vast array of sceneries, in places of which I barely knew. Each day was surprisingly different. The promises implied were well ant truly met. Despite eating and drinking what was presented and available is still managed to successfully lose weight." What a way to remember Provence!" We had a great time. Well organised. The walks were great, places we stayed were fantastic and we are still trying to lose the weight gained from the wonderful food. Would strongly recommend this trip, but it does require a moderate level of fitness." A truly great walk through fascinating old valleys showing a former way of life. Lovely accommodation especially La Clede in the Ardeche and food was great. Highlight was the special walk to Gilles' family farm for a Provencale BBQ with a difference. Up there at the top of what is offered by Walkabout Gourmet." Having done several walks now with WGA this would have to be one of our favourites so far. The walks were challenging but enjoyable. The accommodation was great, small and varied and the food and wine excellent. Gilles' guiding was superb and his knowledge of the areas we went to made it all the more interesting. As it is a smaller group than usual it enabled us to enjoy the company of everyone. We are now looking forward to our next walk." We were a small group led by Gilles, what a wonderful time we had. The weather was perfect and Gilles was a fantastic leader. He enthusiastically and knowledgeably led us on 14 days of, at times challenging, but always extremely enjoyable walks. We discovered unknown parts of France and delighted in the varying terrain. Each walk was different and around every corner was another steep climb, a magnificent vista, a peaceful, pastoral scene. It was wonderful and the photos do not do it justice. The evenings were spent enjoying good food and wines in delightful eateries some grander than others but all with happy memories. Thank you Gilles for the kindness you showered on our group. I think we all left with a greater love for France and many fond memories." 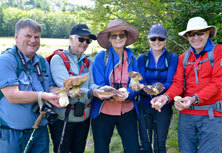 This was our 5th trip with Walkabout Gourmet Adventures. Wonderful tour with guide Gilles including surprise visit from Gabriela at dinner one evening. We met in Aix-en-Provence and drove to Sisteron and finished the trip in Geneva. Excellent accommodation in Sisteron, Queyras, Ardeche and Annecy. Varied walks with fantastic views. The trip included visits to Gilles home in Ribiers and his family farm which were most interesting. Walked to places that you would not find if you were doing it by yourself. All in all, an outstanding experience. We are now considering our next walk. Have recommended Walkabout Gourmet Adventures to numerous people.